Slough Court in Stoke St. Gregory, Somerset is a late medieval manor house. It has the remains of it moat and an interesting barn in the farmyard. It is still a working dairy farm. 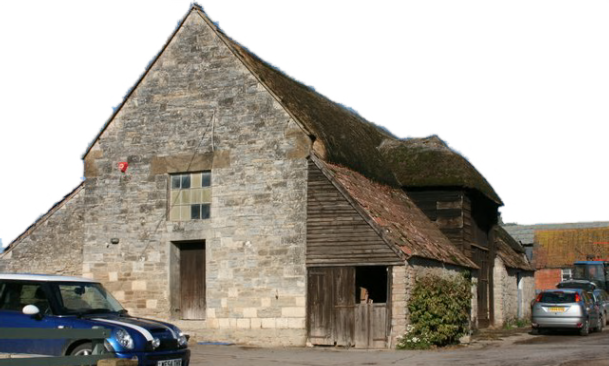 The barn seems to include most of the building materials I have seen in a barn, with both thatch and tiles on the roof, brick, stone and clapboard in the walls, concrete floor and timber roof trusses. It has a single central wagon porch with a hipped thatched roof. External outshuts project from the eaves to beyond the doors of the wagon porch.